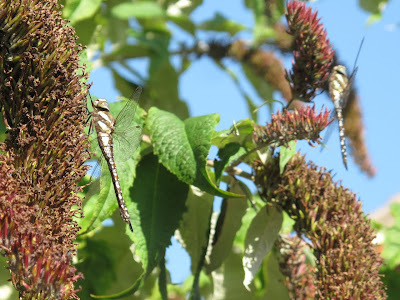 For a week I have been watching hawker dragonflies hunting over the garden well into the evening. 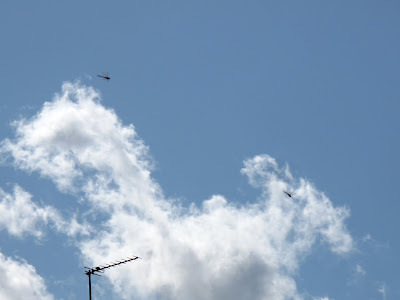 They fly high (3-5 m) and never seem to stop, so I could not identify them. My luck changed today, when early in the morning I came across a male Migrant Hawker (Aeshna mixta) sunbathing on a fence outside. 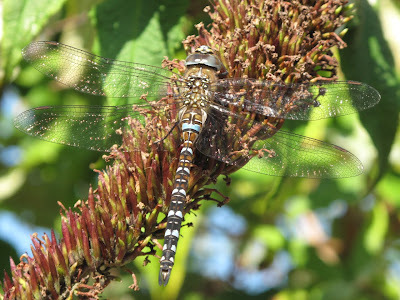 This is the only species of hawker I have identified in my garden and I usually see it in August and September. It is quite approachable and getting close-ups is relatively easy. The male was a little later joined by another individual (a duller male I think) and both sunbathed quite close to each other high up in a buddleia for a while. My usual basic photographic equipment was joined by a chair, so that I could take the pictures. At 11:30 both dragonflies started hunting and they didn't stop again. 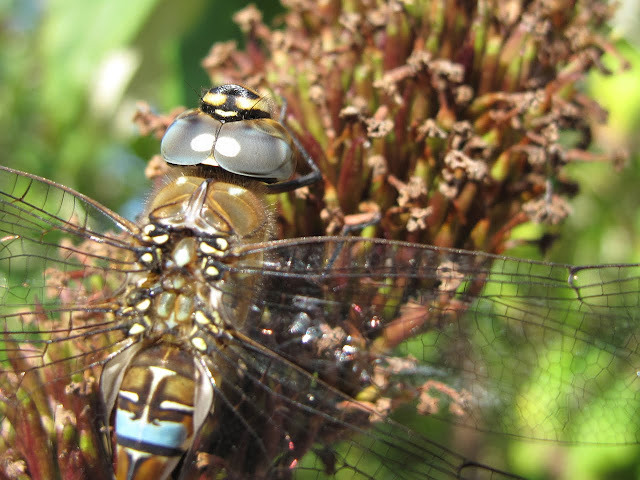 This species of dragonfly is very sociable and regularly hunts in groups. Is also, as suggested by its name, a regular migrant species. Before the 1950' it was quite a rare species in the south of the UK but steadily increased its range and is now found also in S. Scotland and Ireland.